Two tourists got a rental car while visiting Maine and found a scary surprise in the trunk. It was this ... a living python. Just chillin' in the trunk. An ABC reporter said: "Needless to say, they closed that trunk really quickly and then called police, who then removed it. However, they still demanded a new rental car, and I don't blame them." According to WCSH, the reptile spent the night in the slammer but was moved the following morning. It's now at Sparks' Ark Animal Services, according to the police department's Facebook page. Here's the creepiest part: The tourists rented the car at Logan Airport, about an hour and a half from their destination in Kennebunk, Maine. 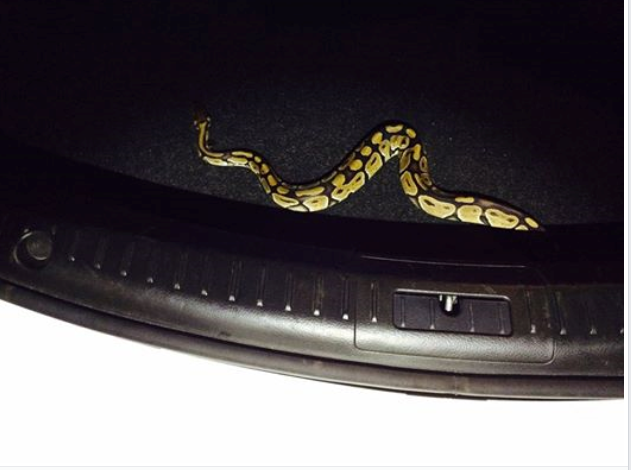 Which means, as WGME points out, the snake was a stowaway in the trunk the entire drive. The outlet spoke with Joshua Sparks from Sparks' Ark. A reporter said: "Joshua Sparks says this sort of thing actually happens all the time." "I had a call a couple of months ago from a woman who found a boa constrictor, a little bit smaller than this, on her steps inside of her house," Sparks said. The snake is a nonvenomous ball python, which is a good pet for snake lovers. This kind of snake gets its name from its tendency to roll into a ball when feeling intimidated. About.com says if taken care of, it can live up to 50 years. Sparks also says the snake never really posed a threat to the tourists. No one is exactly sure how it got in the trunk in the first place, though.